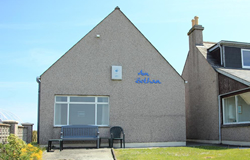 Am Bothan is a modern brick built cottage, double glazed and fully fitted with household appliances but also incorporates the island tradition of coomed upper floor rooms. The unit offers accommodation for up to seven people (based on four adults and three children). Ground Floor: Hall, galley kitchen, toilet/wet room (wheelchair friendly), lounge/dining room and Bedroom no. 1 (twin). Benbecula. Peat burning stove (fuel provided). Kitchen: The kitchen comprises fridge freezer, dish washer, cooker, hob, sink, microwave and washing machine. All crockery, cooking utensils and cleaning equipment are provided. Upper floor: Hall, bedroom no. 2 (triple), bedroom no. 3 (single, child) and toilet/shower room. The master bedroom outlooks eastwards onto the croft behind and is a double plus single with a possible third childs bed.